You are here: Home / Thoughts and Laughs / November’s Punk Pet of the Month: Buckeye! My name is Buckeye, and I am a punk pet! 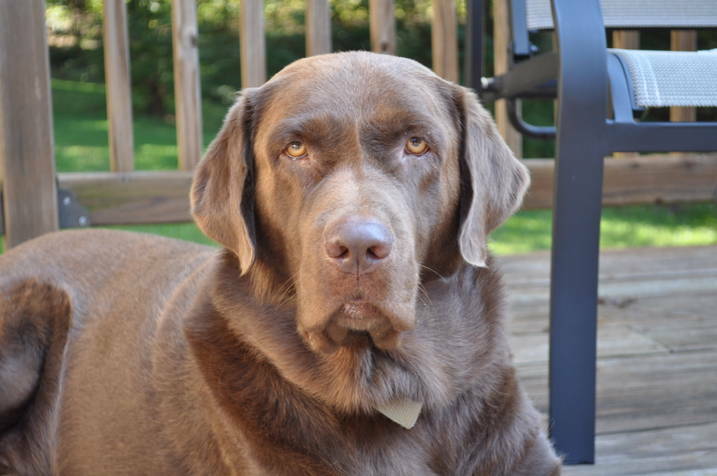 I am a 100 pound chocolate lab. I love to be where my owners are (inside or out), and if possible, I must be touching someone with my big paw. I sometimes can hurt you with my claws, but I really don’t mean to. My favorite chew toy is a 2×4 that I carry around in the backyard, but really any big stick will do! I am very proud of my sticks and must prance around with them to show them off. My owner’s say I bark like a girl and whine like a baby, but I am really just trying to talk to them. My new favorite snacks are the cherry tomatoes in the garden – please don’t tell! Special Announcement! We now have an official sponsor for our monthly “Punk Pets” – Canine Cafe, a local Charlotte company that makes organic dog and cat treats! I am so excited about this. Every Punk Pet will get a free bag of organic treats from Canine Cafe! They have been “Punk Pet Approved.” Check ’em out by clicking on their logo, over in the sidebar on the right! next article: Free Holiday Gift Tag Printables!